This is a great summer meal that everyone will love. 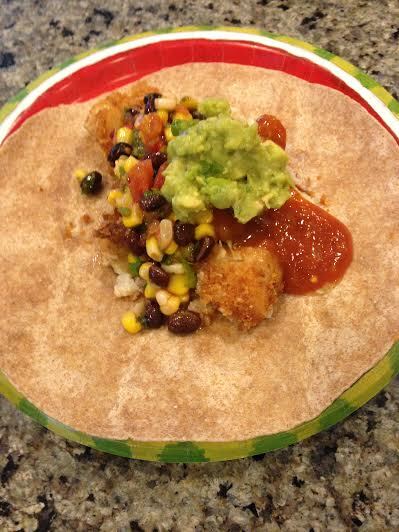 Add a piece of cod, three tablespoons shredded lettuce, two tablespoons of corn salsa, one tablespoon guacamole, one tablespoon sour cream, two tablespoons tomato salsa, two teaspoons diced tomatoes, a few jalapeno slices and top it off with the shredded cheese. This is another flash from my past. 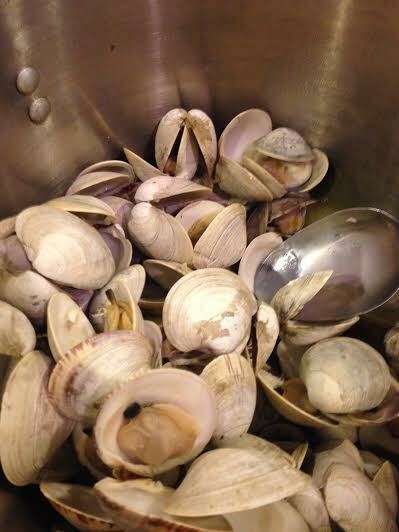 We used to dig clams in Narragansett Bay and my Mom would steam them for dinner. It was such a feast. Steam till the clams are open. Don’t forget the chunk of crusty Italian bread to dunk into the broth. Strain it and freeze it to make chowder. Wash the shells and dry them. 1 to 2 jalapenos depending how hot you want it. Cut the stem off and take the seeds out. Take the husks off the tomatilla and wash the sticky film off . Place the tomatilla skin side up. This is delicious with tacos, chicken, steak, fish or just chips. This is another recipe from my Mom. My Dad had a huge garden and he used everything. When we saw the orange zucchini flower bloom we were so excited. We would carefully pick them, my Mom would gently wash them and leave them on a towel to dry. She never measured anything so I had to figure the recipe out . 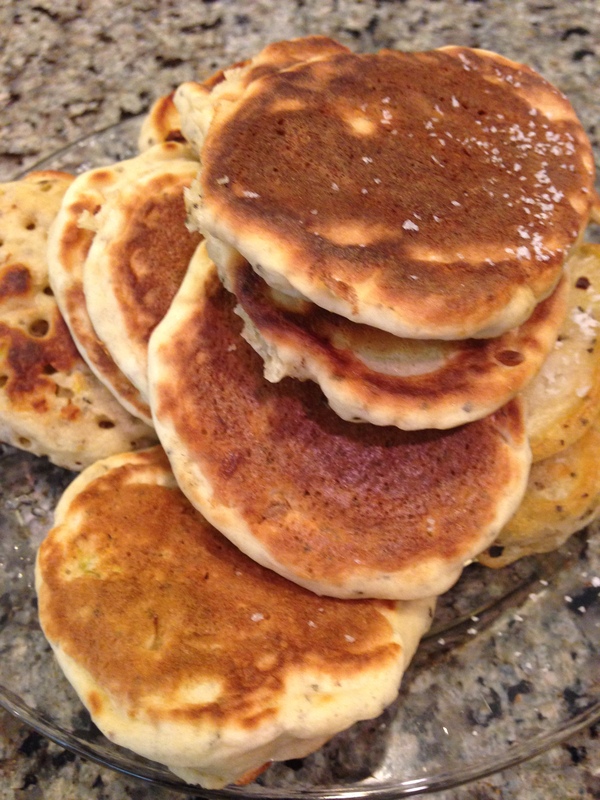 Just like regular pancakes, heat the griddle to medium high. Then turn over for a minute, just to cook the other side. Season with some kosher salt. 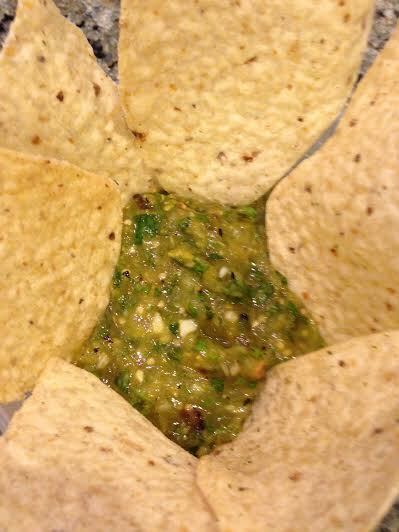 These are great plain or dip them in sour cream or any other dipping sauce you like. This is an oldie but goodie. 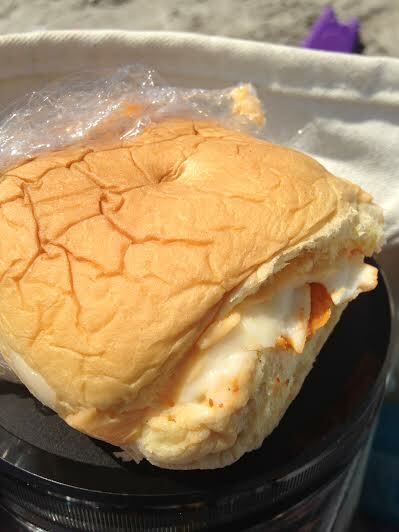 I used to make these sandwiches when I would go to the beach with my Mom. Make two because one is not enough and everything tastes so much better at the beach. My son, Andrew, is smoking everything possible. He has a new green egg and hasn’t stopped playing with it since he got it. 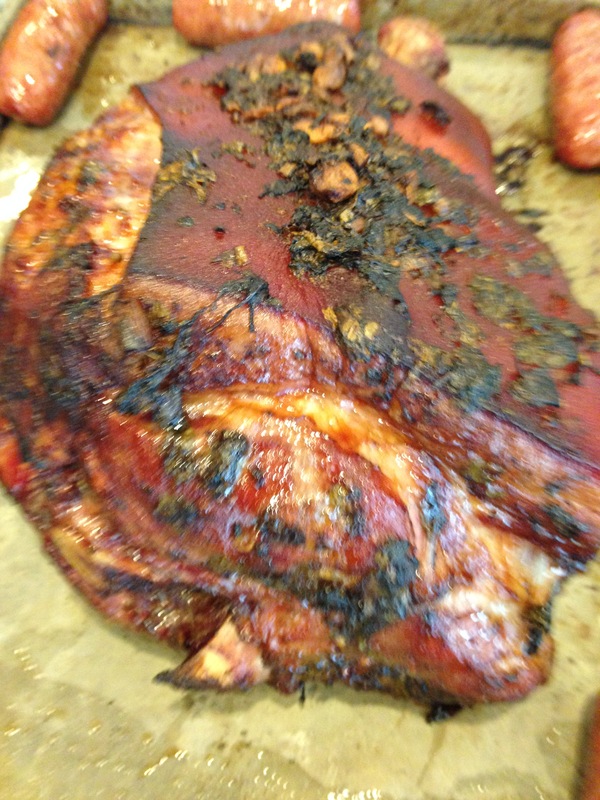 Last weekend he made a pork shoulder that he marinated for three days. Instead of using the bottled Mojo dressing, we had to make our own. It isn’t hard but it takes a lot of ingredients but the pork came out moist and very tasty. Put everything in the food processor, except the pork. Process till it is all chopped. It doesn’t have to be smooth. 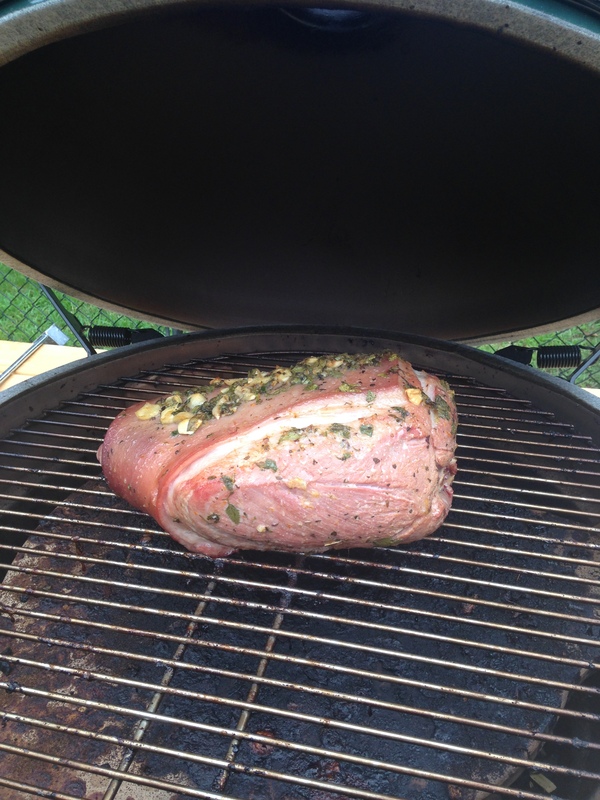 Heat your smoker to 285 degrees. When it comes off the grill, the meat falls off the bone. Great to eat with cole slaw, salad, sweet potato fries, corn bread, BBQ sauce or just make a sandwich. Also good to make tacos and chili. I had a leftover tomato salad . I always use what I have and never waste anything. One small Italian bread, sliced into thin slices. Broil till the cheese is melted. Just lightly coat the shrimp with flour, salt and pepper. Pan fry in a couple of tablespoons of oil till light brown. 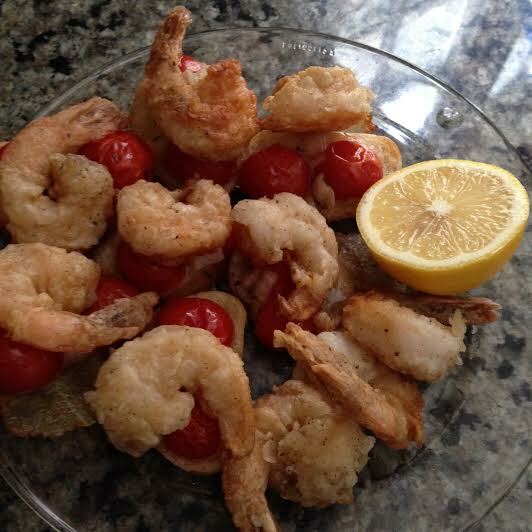 A quicker version is to just pan fry the floured shrimp till brown. Take them out of the pan and set aside. Cook on high heat till the tomatoes start to pop. Add the shrimp and serve with the bread on the side or pour it over pasta. You can add the cheese if you like.